When someone wants to repay you for a kindness you have done for them, ask them to pay it forward to someone else in their life instead. You have been put here to help others. Look carefully in your daily life for the specific opportunities that are around you. Respond in the way your heart asks you to. Here at Pay it Forward UK HQ we have a few ideas on how to make a difference, but we need your involvement too. Share your stories with us on social media. Buy some bands and spread the word. Encourage your child to educate their teachers on how to pay it forward. 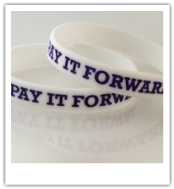 Email payitforwarduk@beckywells.com your UK payitforward stories and we'll tweet them.